Every year around this time, it’s been a tradition to head to MACE, a North Carolina gaming convention that used to be held in High Point. This year they decided to expand, but also switched venues, moving the festivities to Charlotte. 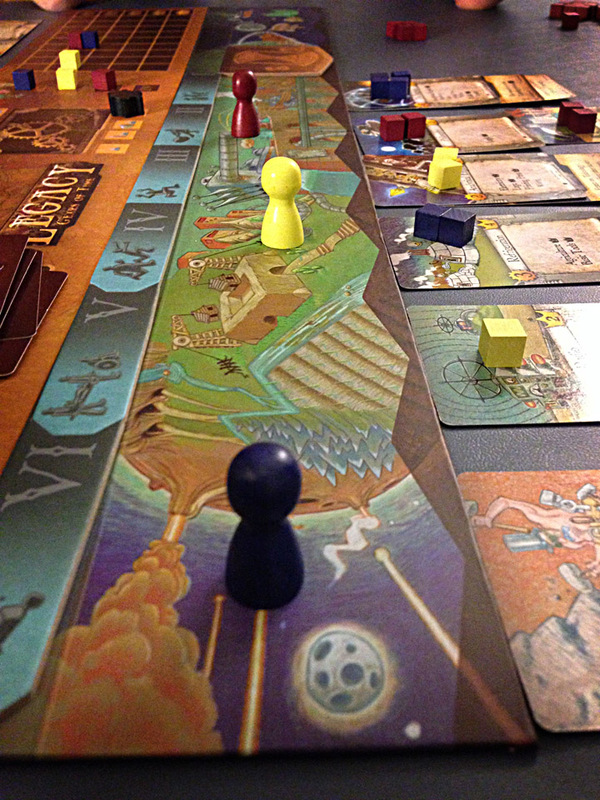 Instead of making the trek west, five local gaming friends and I gathered together at a Springhill Suites in a grand experiment we called SAGCon – SAG standing for Stay And Game. Although we didn’t have all the grand spectacle and amenities offered at MACE, it was still a great time, and we played 17 games over two days. Here’s a look at some of the more memorable experiences and my thoughts on the games that were a part of them. This recently-Kickstarted game was sent to me late in its crowdfunding campaign by Luke Peterschmidt of Fun to 11 Games. The challenge: See if I could get it reviewed in less than a week. The solution: A video impressions session, filmed and produced while at SAGCon! 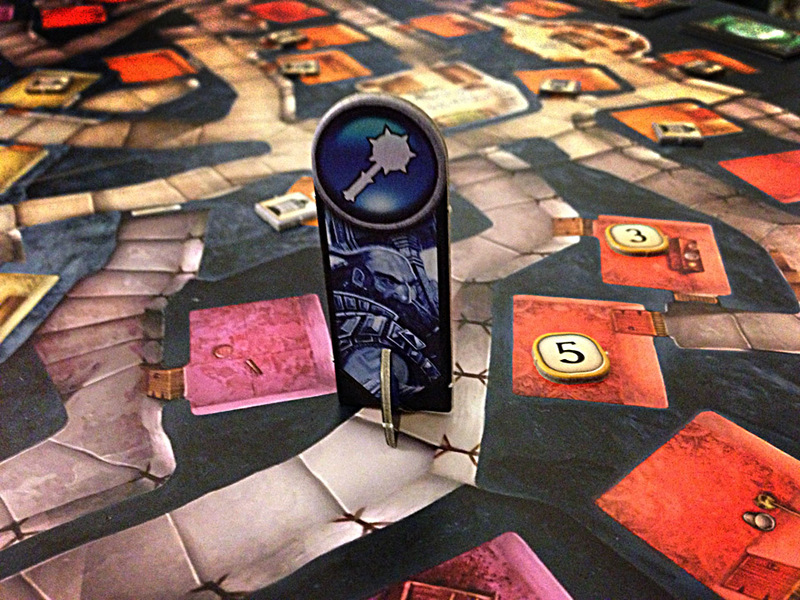 Many of our thoughts can be seen in the video, but what I will say about Castle Dice here is that our brief experience has definitely left me wanting more. Combining 63 custom dice (63! ), a resource management/ worker tableau (tableau!) and three separate stacks of special resource, worker and effects cards (some with words!) proved to be a very potent, fun and satisfying play experience. I only wish the Kickstarter campaign had been a bit longer so many of you could get your hands on this intriguing title. 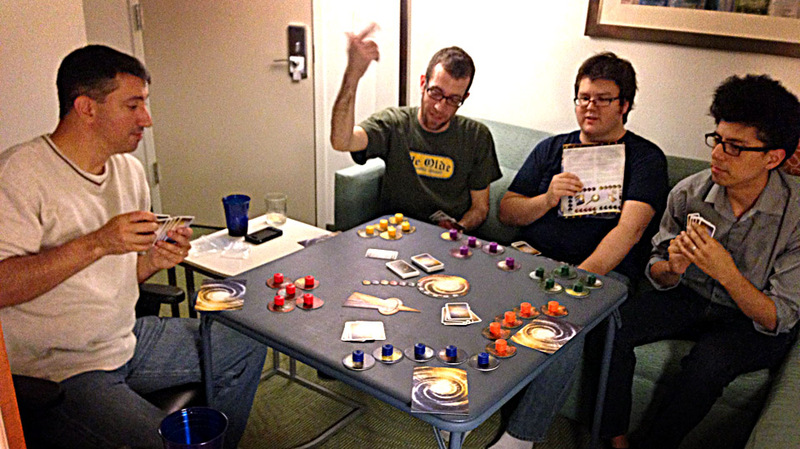 After many years of attending many cons, I have to say that it almost doesn’t feel like a con without at least one good, rowdy game of Cosmic Encounter. No game has stood the test of time with so many game groups quite like CE, and this weekend’s epic six-player showdown was one of the best I’ve experienced since the legendary punk fest at PrezCon in February. Playing the card-raiding Barbarians, I managed to nab the first go, pulling out an immediate Negotiate with Dave and his annoying Tick-Tocks to give us both colonies and the shared lead. From there, I just held on tight, got in on the best deals and helped convince the Tick-Tocks that it would be in their best interest to parlay a three-way win with me included. Score! I love this game. I first discovered Ugg-Tect at GenCon and have been kicking myself for not picking up a copy. 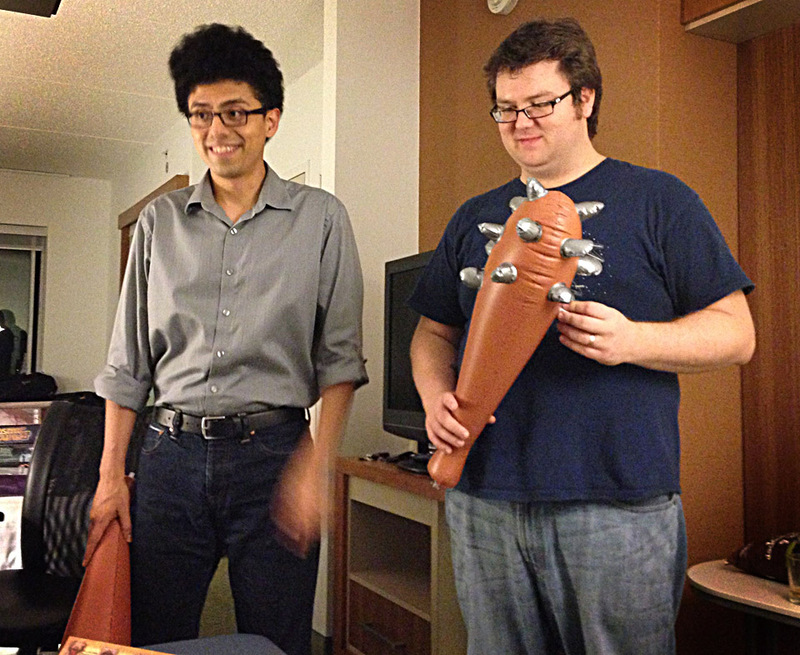 Luckily, Daniel Solis nabbed a copy and we broke it out. 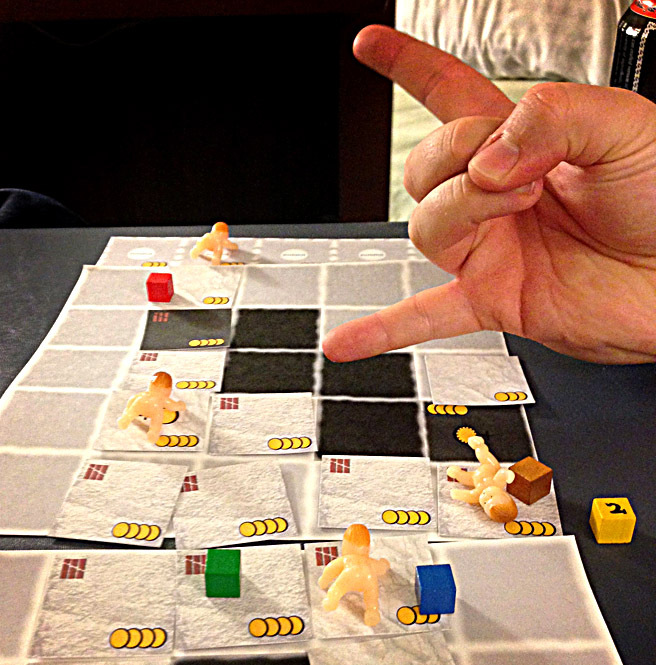 For those not familiar with this quirky game, players are cavemen trying to build structures from big, chunky blocks. One player on each team is the ugg-tect (architect) and must direct the other teammates in putting all the pieces together using a vocabulary of grunts, set hand gestures and their inflatable club. Yes, it’s as ridiculous as it sounds, but it’s a wonderful way to get four or more grown adults to act like complete idiots in the name of civilized progress. Plus, it’s as fun as you’d imagine – as soon as you put inflatable clubs in anyone’s hands, you just know goofy entertainment can’t be too far behind. Some of you dear readers may have seen a picture or a mention here and there about designer T.C. Petty III’s rock-climbing press-your-luck title-in-progress about little babies that could. We got a chance to break it out late at night at SAGCon, and it makes an excellent game to play as a pick-me-up in the wee small hours of the morning. The key mechanic in Rockbabies makes the game tight and fuels the press-your-luck tension; it also happens to be incredibly appropriate since it involves flipping coins. You’d think that measuring climbing aptitude with such a binary output method would be limiting, but it’s incredibly satisfying and feels fresh. And, if your baby gets in real trouble out there on the rocks, you can always grab the massive Danger Coin and press your luck even farther. I don’t like throwing around the word unique too often, but I’ll safely assign Rockbabies this superlative. I’ll keep my eyes open and my ears peeled for more info. on Rockbabies in the future, so stay tuned to Dice Hate Me. Like most Alf Seegert games, Fantastiqa is full of whimsy, wit and a ton of intelligent gameplay. 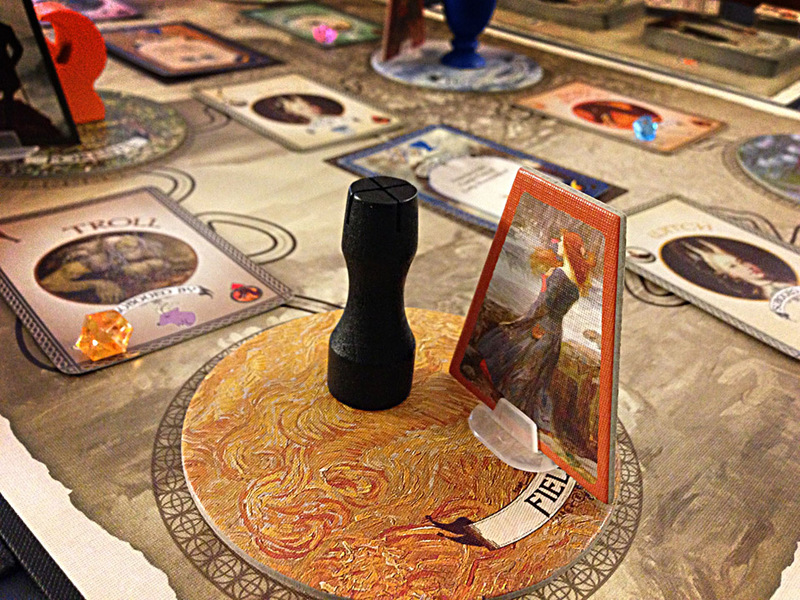 It also happens to be full of a lot of components and more than a fair share of somewhat-perplexing strategy. At its core, Fantastiqa is a deck-builder; around the Dice Hate Me household, that descriptor is oft-considered a four-letter word. However, when placed in the hands of Alf, the deck-building becomes less of a matinee attraction and much more a means to an end. Overall, the game ultimately won us over with its off-beat and unique atmosphere, but it’s definitely going to take a few plays to wrap our minds around the complete strategy. That’s ok, though – the wild world of Fantastiqa makes it easy to justify return visits. This refurbished classic used to keep me more than enthralled as a child; I acquired my first copy of Dungeon! around 1982 when I begged my mom every time we entered the toy store. I reacquired a re-release copy in the early 90s and still have that as a treasured possession; it can go on record as one of my most-played games. And, now, it is with great joy that I must announce that – despite the crazy-cheap components and teeny, tiny box – the newly-released Dungeon! from Wizards of the Coast accurately and reverently reimagines that dungeon-crawling classic from so many of our youths. Here’re the rules: Pick one of four classes. Learn how much gold is needed to win. Adventure among six levels of varying difficulty in the dungeon; when encountering a beast, check your class and then roll 2d6. Success gets you one step closer to victory, while defeat forces you to roll again on the damage chart. And that’s it – it’s that simple. 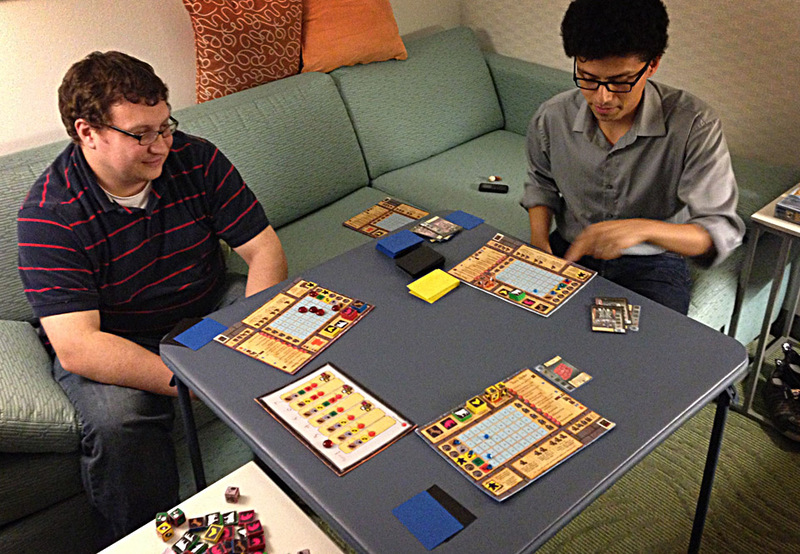 It’s that simplicity – combined with the atmosphere and archetypes – that make Dungeon! not only a wonderful trip down memory lane, but also a gaming experience that you’ll want to share with the less-enlightened. In the end, consider this – Dungeon! was the only game to be played twice at SAGCon, and that’s saying something. Time travel is a personal passion of mine. Granted, I’ve never been successful in doing more than springing forward and falling back, but amateur quantum theory has been a pursuit since my early youth. And, so, when it comes to anything dealing with leaping of the quantum variety, I am more than interested. Luckily, I found Ben Harkins in a corner of GenCon and he was generous enough to let me walk away with this temporal goodie. I had played Legacy previously with Monkey238 and it was a fascinating two-player experience, full of tension, deep thought and taut give and take; the three-player experience at SAGCon only upped the ante. Easily the game of the weekend – and, possibly, a Game of the Year contender. Keep your eyes on Dice Hate Me over the next few weeks as I dive into this deliciously deep indy darling. If, after reading Dice Hate Me for awhile or listening to The State of Games, you don’t yet have Yspahan, just get it already. Seriously. 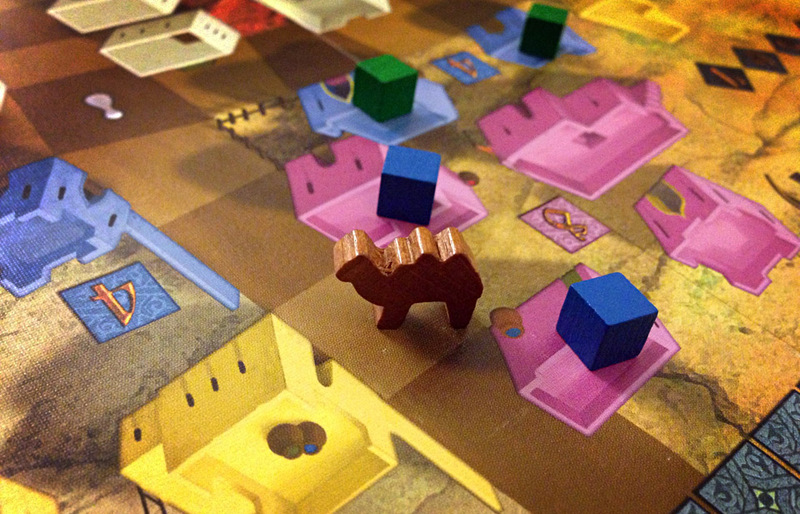 No game library should be lacking this wonderful mainstay of dice, camels, caravans and careful consideration. Look for more thoughts on these games as well as personal experiences from myself, Michael Harrison and Shawn Purtell on the next State of Games podcast! Arg! You left off the benevolent Healers, whom, with our invite you couldn’t share said victory in CE! Healing the galaxy and establishing colonies since 2012! I phones posted earlier, but it must have failes. I was interested to see you take on Legacy after it got big tim thumbs down from the group playing it at local game day. I will give it antoher look. Matt – Yes, definitely give it another shot. And my only regret from SAGCon? Not getting Fleet to the table! But I’m gonna get it to the table a few times this weekend at the 24-hour gaming marathon. GeekJock – Hahah yes, you’re absolutely right – I couldn’t have done it without your Healers, buddy. Looking forward to playing again this weekend!